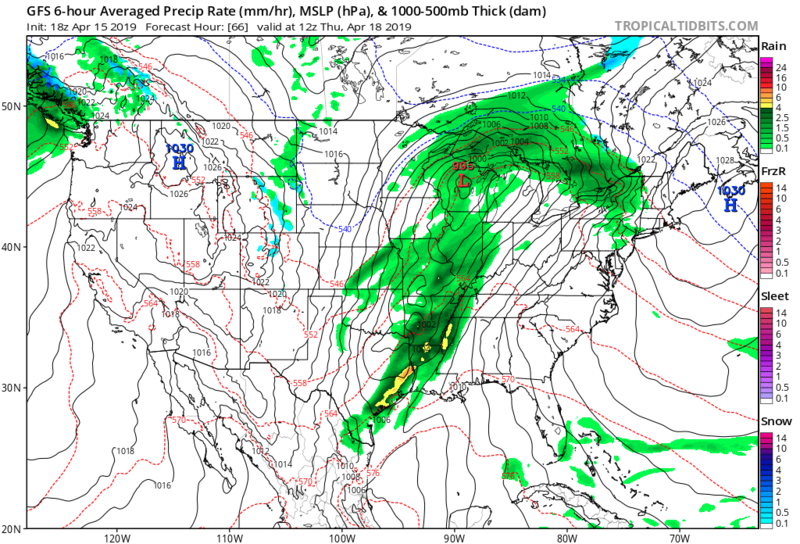 Extreme Temperature Diary-April 15th, 2019/ Spring Severe Storms Affecting The South…Any Climate Change Connections? Severe Thunderstorms Affecting The South…Any Climate Change Connections? Yesterday we hinted that recent Iranian flooding could at least partially be blamed on climate change. Severe weather this time of the year across the southern U.S. is a climatological norm, but could recent tornadic activity be blamed on global warming. What about the next strong system to affect the South? While devastating, I just don’t see much out of the norm in association with this last weekend’s severe outbreak where it occurred geographically, stretching from Texas into Mississippi. Sometimes a system, despite climate change, will mirror normality, moving over an area where severe storms are expected given the time of the year, in this case April. We should not blame all severe events on climate change since these have been with us since we became human eons ago, but are there trends of these getting more destructive? 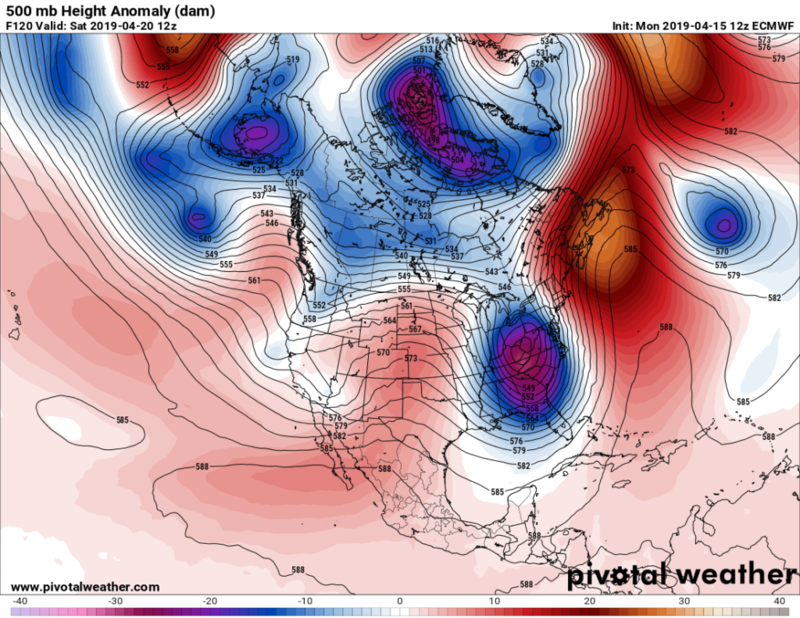 As depicted by the above Pivotal chart bubbles of warm, red anomalous heights stretching from Alaska to Greenland were interacting with numerous cold, blue lobes, aiding to form these and forcing them south. The most southern was the lobe shown on the chart over New Mexico, which was responsible for the outbreak. I seriously don’t think that anyone will take the time to assess attribution for this system, though, since there are much bigger fish to fry. By Saturday severe weather will be over for most of the South, but if the system remains as strong as forecast there will be widespread reports of damage, and a lot from tornadoes occurring along and near its associated front in its wake from Wednesday through Friday. Notice how pinched off the storm system is, being a strong closed low over the Kentucky, West Virginia, Virginia border on the above Pivotal chart. 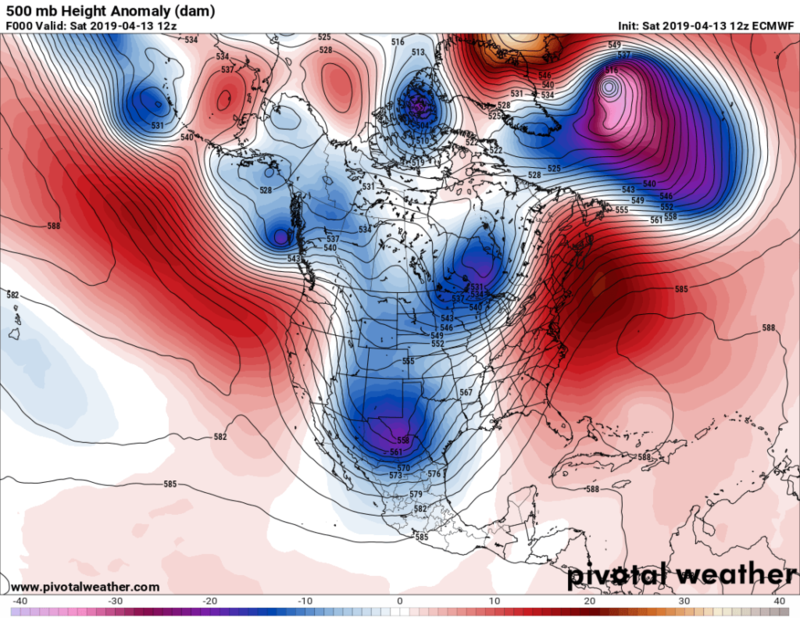 Could we argue that global warming was responsible for the pinching and formation of the closed low by Saturday morning? Perhaps. Given a colder climate this system might be a full latitude trough (in met speak) that would have had less instability (or warm, moist air to work with), perhaps not producing severe storms quite as far north as say the Middle Atlantic states. Notice that I used the words might and perhaps here. Since we don’t have a colder twin of Earth to compare we just can’t definitively state that recent global warming is producing worse storms, but we do have a few clues to point to. First, temperatures have been above average during April across much of the South. Second as mentioned here and on yesterday’s Iranian piece the overall jet looks weaker with more perturbations than is average for mid April. We would expect a weaker but more disturbed polar vortex in a warming world. Well folks, batten down the hatches again by Wednesday if you live in the South and Midwest. As my favorite old actress would say, It’s going to be a bumpy ride. The #Antarctic freeze season is well underway. Sea ice in the Southern Hemisphere has a large seasonal cycle and is mostly first-year (thin) ice. Chinese scientists have invented #solar panels that can generate power at night. “Next generation must keep their own carbon levels at a fraction of their grandparents’..